I am guessing this will be my second to last 9/11 post. Just a hunch. I figured I'd do one for the 15th anniversary, next year. I don't particularly think this blog will be around at the 20th. I've been known to be wrong, but another six years of blogging seems daunting, at best. 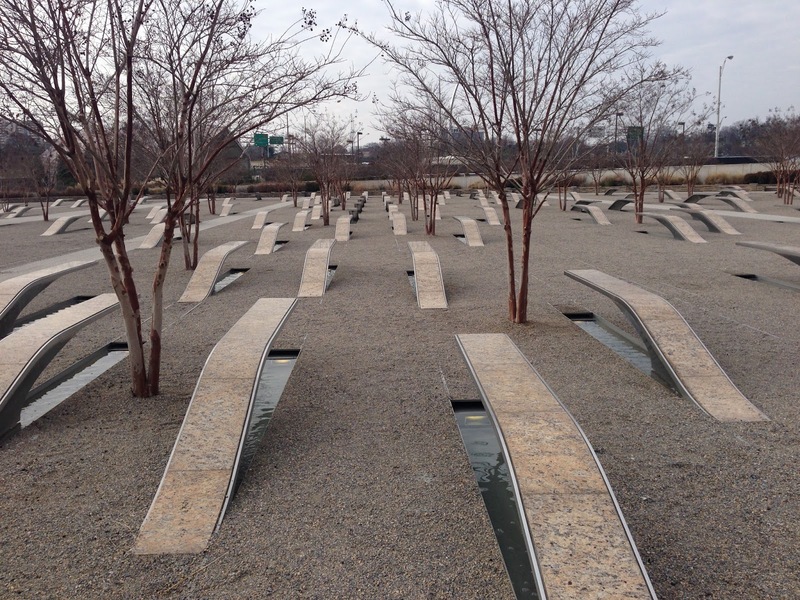 This last December, we made it to the last of the 9/11 Memorials. 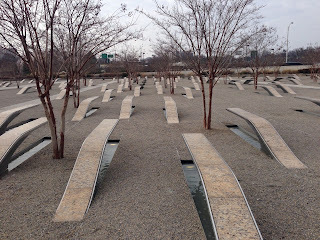 We'd been to the WTC site - any number of times - three weeks after the planes hit, a half dozen times during construction and once so far since that memorial opened. Three and a half years ago we stopped by the Shanksville site. Finally in 2014, we got to the Pentagon site. It was an over the river and through the woods things. Well - under the river, until the Metro dropped us at the Pentagon. But it was a long long walk around the building to get to the site. Lots and lots of signs saying 'no cameras'. I was not that deterred. The space is nice. Considering. The "considering" is that it is built basically adjacent to a parking lot. "Considering" it abuts the Pentagon itself. 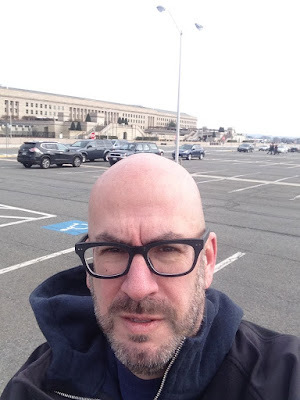 "Considering" you are under many a watchful eye because you are actually next to the Pentagon itself. Flight 77, oddly enough, came in such a direction it probably did the least damage it could. Had it come any of the other four ways, parking lots, the Metro, shopping centers and freeways could have all been ruined with many more lives lost. It went through an empty lots before hitting the building. 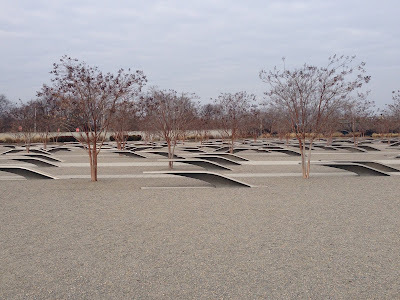 The Pentagon Memorial might not get a lot of tourist visitors, just due to the amount of walking one must do to get there. It's out of the way. We were two of a half dozen on a cold December day. I liked that. I wanted to experience it without the throngs. 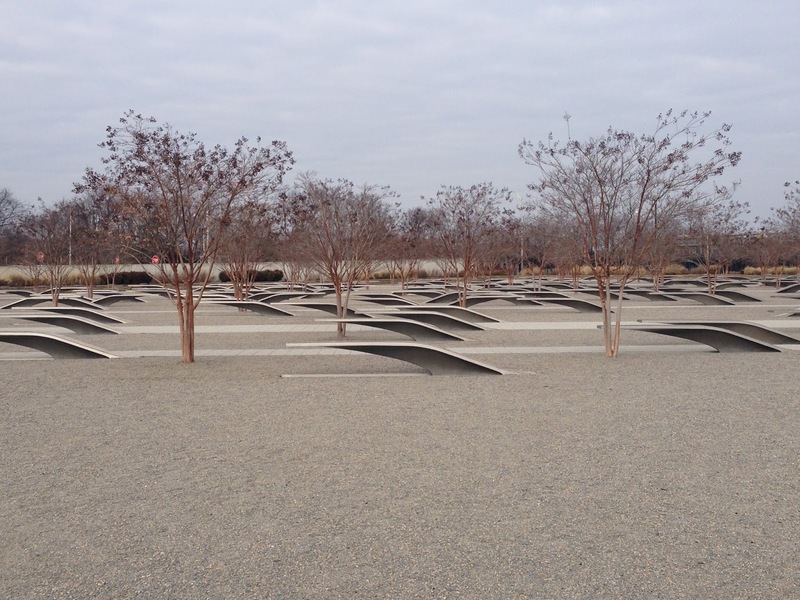 I love the meaning behind the design of such memorials. I get that there are 184 "benches" for each of the military and civilian victims. Benches that seem to be facing toward the building are those of people on the plane. 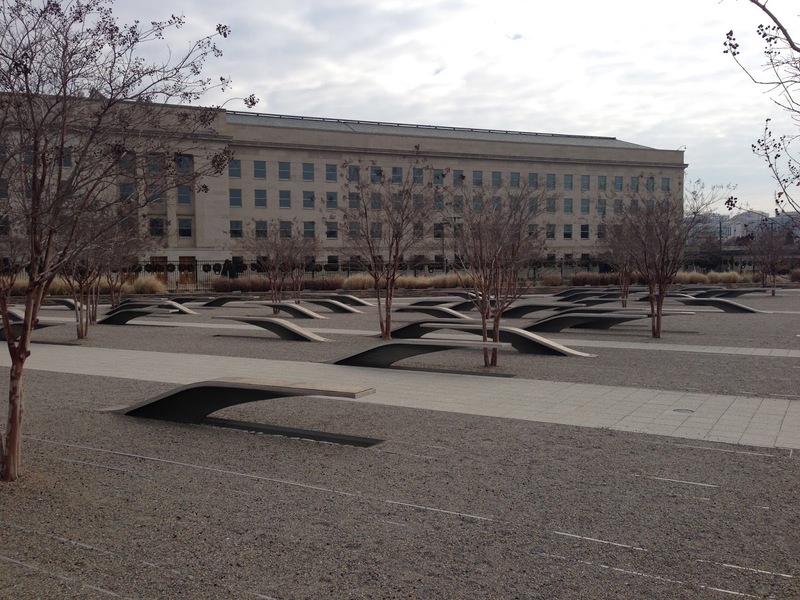 Benches seemingly facing away from the building represent victims in the Pentagon itself. Benches are arranged from youngest victim (3 years old) to oldest (71). Each bench is marked with the victim's age and name. I'm not sure I liked that methodology, as people traveling or working together are split up, but it is kind of hard to come up with another logical way to represent them all. There are pools of water underneath each bench - the length and width of the benches - and they are lit at night. I'm sure it is quite a site to see, though we didn't stick around until after sunset. The surrounding wall goes from 3" to 71" - again, in correspondence with the youngest victim to the oldest. There are free audio tours (download on your iPhone). Actually, "considering" they did a nice job with the place, though GWB and Donald Rumsfeld's names are listed in the marble at the entrance, so that's a downer. Oddly, picture taking wasn't truly prohibited. 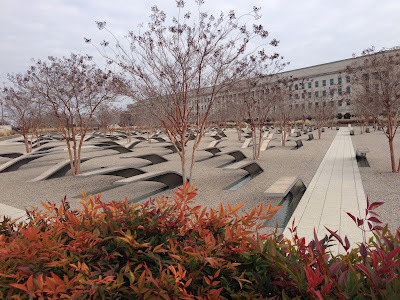 It's just not what I thought it would be, as it's almost impossible to take pics at the memorial without getting shots of the Pentagon itself. The Air Force Memorial just up the hill, near Arlington. 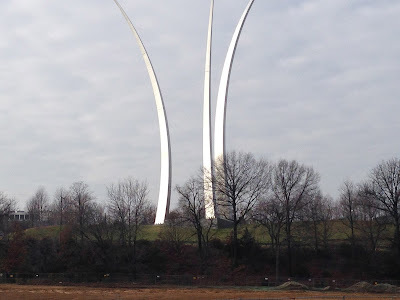 It's not so much that I took the pic of the memorial, as much as it was I took it from the Pentagon parking lot. THAT is a no-no. The fear (?) is that you get a license plate of an employee of the Pentagon. I'm not a proud man. 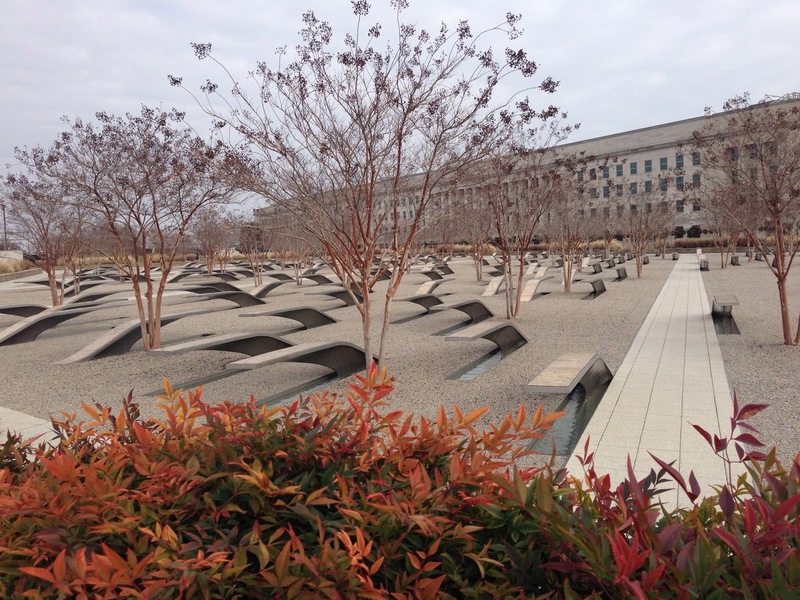 But if you ever find your way to DC, I suggest making the trek to the Pentagon to see this. memorials are fascinating to me viz. what goes into them and how some 'do well' and others flop. I should make a trek to DC; so many fascinating things to see there. I like the use and re-use of the numbers. I'll add this to my list of places to go see. And I like your frames. They fit your face well.